Emma Hawes was born in Delaware, Ohio. She trained at the Ballet Met in Columbus, Ohio and Canada’s National Ballet School. 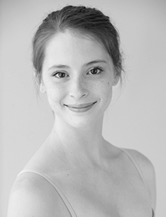 Ms. Hawes became a member of The National Ballet of Canada’s Corps de Ballet in 2011. As a student Ms. Hawes danced The Swan Queen in Swan Lake and roles in Serenade, Yondering and Sequentia.